Our Price $3,995.00 The new XT 8000 portable walk through metal detection system is a full featured digitally controlled unit that can be deployed in less than five minutes, yet stores away in a rugged carry bag for easy transport. XT 8000 is simple to set up and operate without specialized training. The system can be moved regularly to different facilities to provide security and deterrence while costing thousands less than permanently installing units at each site. XT 8000 utilizes quad coil detection fields and the latest in digital microprocessors to pin-point any metal object passing through the system. Stand alone control module sits at eye level and provides easy set-up. Both Audible and visual alert is given upon detection. Multilevel sensitivity settings and volume controls add to the versatility of the XT 8000 system. 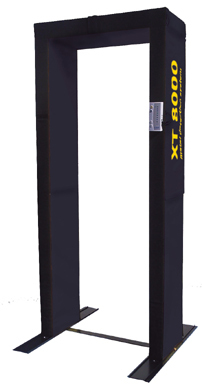 XT 8000 may be used in tandem to cover a wide hallway or gated area. The XT 8000 is much more attractive than conventional metal or plastic housed units and can be purchased in school or company colors with custom logos. XT 8000 electronic components are resin sealed into structural PE laminates and interior lexan panels. Exterior housing is made of weather resistant ballistic nylon sections that easily fold into a rugged 40" X 14" X 14" transport bag. Power: 110 volt AC adapter (supplied) or optional 12 volt battery pack. Throughput rate: 50-60 detections per minute. Alert Modes: Illuminated LED visual intensity scale with large alert flasher and adjustable audible horn. Sensitivity: Multi-level electronic adjustment for various target identification. Control Panel: Eye level digital electronic control module with simple keypad is easy to program and easy to monitor. Flow Metering: "Go and Pause" indicators increase throughput and reduce false alerts. Anti-false alert feature: Sophisticated electric eye technology reduces false alerts. Detection: Alerts to all metal objects, not just ferrous materials. 40" x 14" x 14"